Solid-phase extraction (SPE) is designed for rapid sample preparation and purification prior to chromatographic analysis. SPE is widely used in analytical laboratories for it is a crucial step in sample preparation. We know perfectly well that a cleaner sample yields better result. Bed weights from 1 mL/50 mg to 25 mL/5 g.
Larger bed weights are available in SiliaSep™ OT. 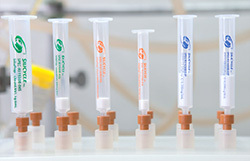 SiliaPrep cartridges are packed with fines-free SiliaFlash® silica gel sorbents or SiliaBond® chromatographic phases. The well plates are used in high throughput combinatorial chemistry, drug discovery and screening, metabolic pharmacokinetic applications, and for automated methods such as a multiprobe approach.